More than thirty years ago, the course of Jo Lynn Osborne’s life was forever altered the day her twin sons were born. Several months after his harrowing birth, her son David would be diagnosed with cerebral palsy. Already struggling with tremendous loss, now she had to face the uncertainty of parenting a child with a disability. This is the story of one remarkable woman’s transformation from a heartbroken mother to a vigilant advocate for her son and for all people with developmental disabilities. As she tried to make sure David had the same choices as her other children, she changed her family, her community, and the lives of thousands of families who followed in her footsteps. 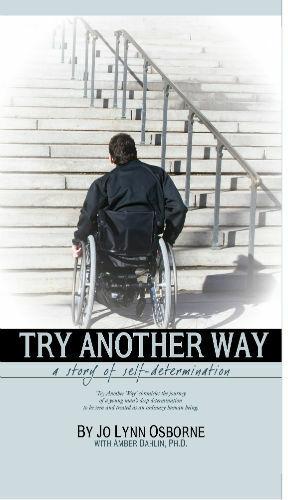 Through his mother’s persistent advocacy, David learned to advocate for himself and, as much as this is Jo Lynn’s story, this is also the story of a determined young man’s quest to live a full life on his own terms. +Contact us at (303) 232-1338 to purchase by phone for in-person pickup. +Use PayPal for a safe, online checkout.